Started in 1896 as a headstone and stonemasons yard in Chester le Street co. Durham, the family business prospered and grew under the family name of G.W. SMITH. 1947 saw the third generation operating shops in Durham City, Houghton-le-Spring, Middlesbrough and Spennymoor, as well as the original Chester le Street branch. In 1964 a new factory site was acquired to allow for future growth in production and in 2004 the adjacent coal yard was purchased, giving North East Granite Co its current 3 acre factory and distribution centre in Langley Moor Durham. In 1993 The current managing director Mr George Smith added focus to the wholesale market, continuing to grow the company’s client base in the headstone and funeralcare markets whilst maintaining a retail presence. The company has continued to expand developing interests in architectural work for public spaces and domestic environments. Headstones are manufactured alongside public sculptures and furniture for domestic settings and townscapes. 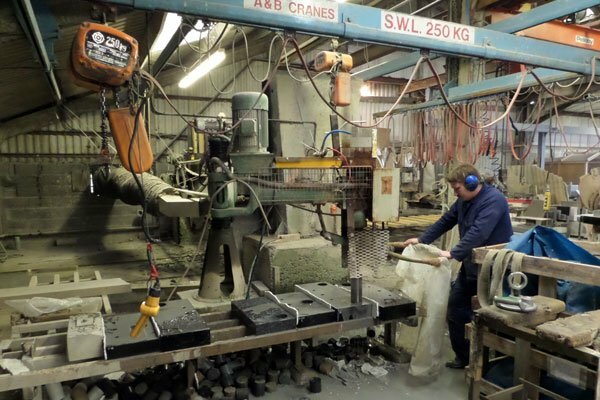 “Made in Britain” is our mantra, with over a third of our headstones and products produced from granite, stone and marble slabs in our factory. Now with a sixth generation of family members guiding the company; we are progressing and growing, looking forward to the next 117 years!